Smith’s world is timeless yet also old-fashioned, and charged with atmosphere: it’s as if something terrible has just happened or is about to happen ‘off-stage’: in this world, everyday domestic objects such as a wine glass or a christening spoon take on ominous resonances and other people remain faceless, nameless. The voice is abrasive but so softly-spoken you hardly feel the rub until too late. Because they are so short and so laconic, some of the poems tread a fine line between understated control and a prosaic flatness of tone but most of the collection carries the risk well. And the collection as a whole has a satisfying shape. Elspeth Smith’s voice is strange: a little Stevie Smith, a little surreal: yet hers is a very individual English tone, slyly humorous, eccentric and uncompromising. 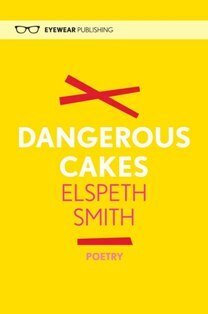 Dangerous Cakes is a fine title – and she is excellent at all her titles – well worth dipping into. It’s bracing as cool British seawater.